With a combination of technical expertise and real-world business experience, Primo Interactive specialises in developing creative, technologically advanced websites that, backed by innovative marketing campaigns, deliver clearly measurable results to your bottom line. 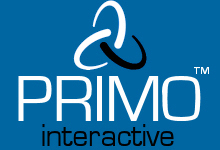 A website produced by Primo Interactive will feature W3C compliant, hand-written code, optimised according to search engine guidelines to boost your website's rankings for the search phrases that matter to you, maximising the visibility of your site and attracting targeted potential customers. Our state-of-the-art hosting services ensure your website will be fast-loading, reliable, efficient and scalable. Based on high specification dedicated servers at a private UK data centre and backed-up with a network of global, low TTL DNS servers providing maximum speed, response time and network uptime together with a resilient international content delivery network (CDN) giving you high availability and performance, increased conversions, happier customers and better SEO. Selecting a company with which to entrust your online presence is a big decision and we know from experience that obtaining web design quotes can be a frustrating, time-consuming experience. At Primo interactive we make the process stress free by providing free, no-obligation consultations, proposals and quotations prior to any commitment. Please Contact Us to request a quotation. Our web design, development and marketing methodologies have been designed around the digital marketing lifecycle - Acquisition, Conversion, Optimisation and Growth. We have solutions to suit businesses of all sizes, from owner-run enterprises to multi-national corporations and we pride ourselves on always providing you with clear, jargon-free information, enabling you to make informed decisions. Headquartered in Chester, Cheshire and with offices in Vilnius, Lithuania, we have been providing digital marketing services including Software Development, Website Design, Database Development, SEO, PPC and more throughout the UK, Europe and Worldwide since 2006. We have been working with some of our clients throughout these 13 years and are proud of our customer retention ratio, which we believe is achieved by working closely with clients to thoroughly understand their goals and supporting them throughout the entire business lifecycle, rather than trying to sell a pre-devised solution that may meet some, but not all of their requirements.